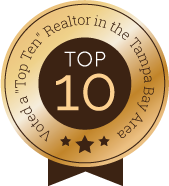 Selected as a top ten Realtor in the Tampa Bay Area on "TampasTop10". Thanks to our valued clients and friends for your continued support. We are honored to be your top choice for Tampa Bay Real Estate for over 12 years. Serving real estate buyers and sellers, in Clearwater, St. Petersburg, Largo, Tampa, Seminole and the greater Tampa Bay area. Start your Clearwater home search here. If you are looking for help with St Petersburg Florida or Clearwater Florida real estate, whether you are seeking a St. Petersburg house for sale or a Clearwater condo we can help. You can begin your search for your new Clearwater home or St. Petersburg condo by performing our free MLS search below. If you need an appointment to see one of the listings on our free Tampa Bay MLS Search call us now at 727-576-6424. Bullard Realty has the agents, experience and know how to get you into your dream home. © Copyright 2019 Bullard Realty, LLC.